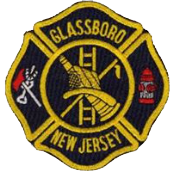 The Glassboro Fire Department is a combination volunteer and career department, but primary staffing is accomplished through volunteers. To become a Glassboro volunteer firefighter one must be at least 18 years of age. The benefits of becoming a firefighter are many and the sense of brotherhood and accomplishment is unlike any other. 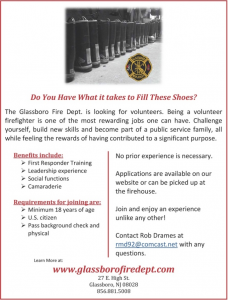 Anyone wishing to find out more about volunteering with the Glassboro Fire Department is urged to contact us via the “Contact Us” tab or by calling 856-881-5008. You can also download the application below and return it to the firehouse located at 27 E. High St.